Just outside of downtown Portsmouth, located at 1 Redhook Way in Pease International Tradeport, is the much-loved Redhook Brewery. Known mainly for their beer, they also have a top notch food menu. To help us introduce the brewery we met up with Kitchen Manager, Drew Holliday. We're happy to be here, Drew! 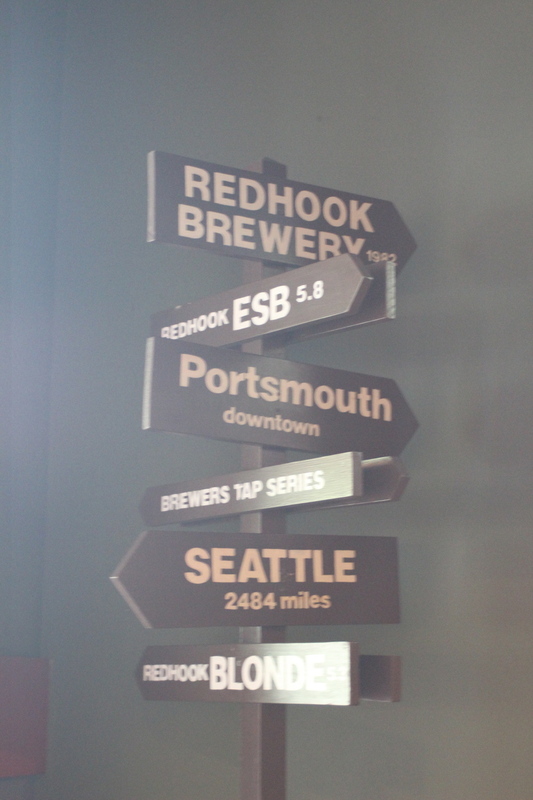 Please tell us a little about Redhook Brewery. Casual dinning in a Craft Brew Pub environment. Our dining room is large designed with elements of the brewery in mind. We offer tours of our brewery operations, with tastings of our current beer offerings. With menu prices ranging from $7- $15, with daily soup and special offerings. Our pub menu is designed to incorporate the beer we brew and the local flavor of the seacoast region. We purchase all our food locally, buying hormone and drug free meat and fish, and organic vegetables when ever possible. As we were trying the delicious beer, our first dish came out. The Falafel Platter is house made Falafel with Kalamata olives, cucumber, feta cheese, and our own Tzatziki sauce. Next, we had the Baja Salad. What's in this salad, Drew? It is made up of tortilla crusted haddock, served over a black bean, corn and romaine salad tossed with a roasted jalapeno vinaigrette, topped with a cabbage and jicama slaw. The very popular Chicken and Waffles was our next menu item. Everything tasted amazing! What is our last dish, Drew? The BBQ braised short ribs, which is slow cooked with a porter BBQ sauce and served over a bacon, jalapeno and pepper jack corn bread, topped with fried onion straws. Thanks for having us, Drew! We'll definitely be back to grab a beer and some more fantastic food. Please talk about what it means to be an independently owned business. We have a commitment to sustainability; our brewery operations run 94.6% waste free (with our 2014 goal to be 99% waste free). We compost, recycle and sell back our spend grain and used fryolator oil to local farmers. We are currently under review for certification with the nation wide Green Restaurant Association. The pub has been here for 16 years and is an ever-growing local partner of the City of Portsmouth. We donate 10% of our sales every Tuesday to a rotating local charity. And we feature a dedicated tap line for local microbreweries, as a way of supporting not only our local breweries but also the Craft Beer movement overall.